This was our second visit to Olympic Provisions, but just our first visit to the SE location. I added it to my list 9 Breakfasts I’m Excited About just so I could checkout the other space. I have to say I loved this location. It truly feels like a hidden gem, mostly because it’s really hidden. You aren’t even really sure you are entering into the right door of what feels like a warehouse, but it leads right to it. Inside it’s truly a Portland restaurant with it’s funky look that is all it’s own. A wall of cocktails and canned goods along with the huge MEAT sign. Tons of bar stools up front with a view of the action, and lots of tables aligned along the wall. 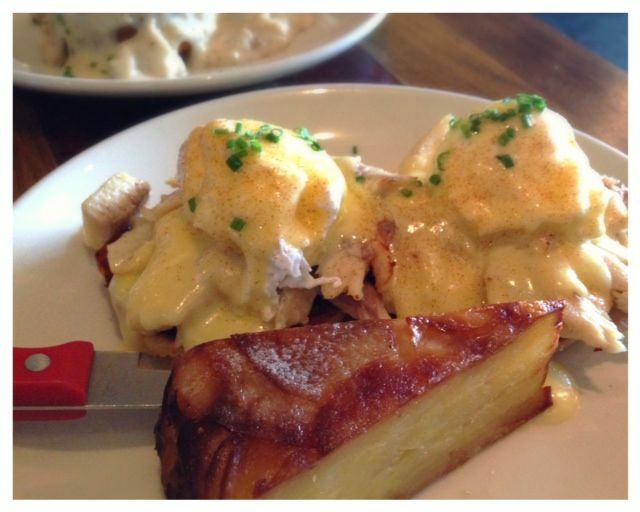 Olympic Provisions has one of my most favorite Eggs Benedict in town. I had ordered it before with ham, but this time (yes I checked the menu to make sure I didn’t want anything else) I ordered it with smoked trout! Off the charts amazing! 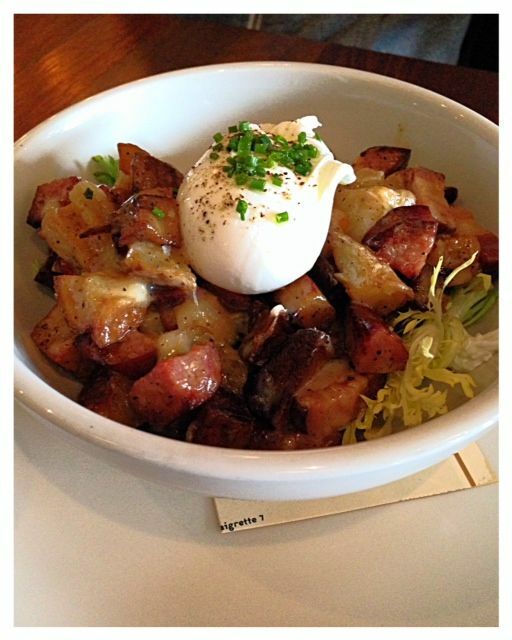 The Kielbasa hash is also another huge contender. It’s served in a large bowl and loaded with flavor. It has a good base of potatoes, which is key to a good hash. This time we also tried the Biscuits and Gravy. 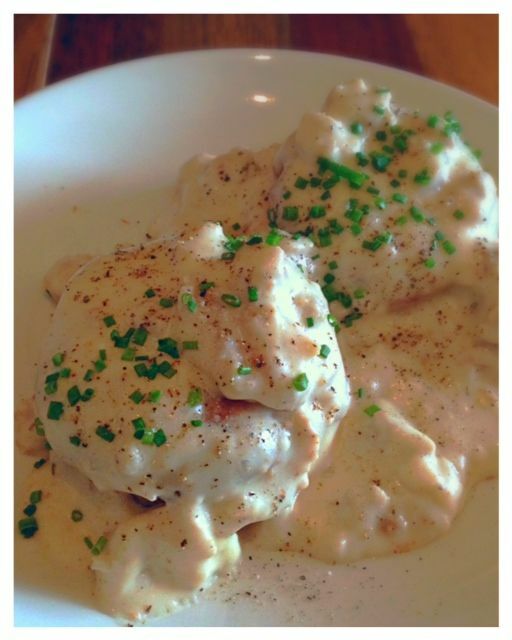 I really liked them, even though I’m not a huge fan of biscuits and gravy. My son said they were some of the best he had. (He’s on a mission to find some in Portland that are as good as Word of Mouth). All I have to say is another great meal at Olympic Provisions. I liked the SE location better, my husband prefers the NW. All that to say, you can’t go wrong with either location. Now to add them to my dinner list. I have not had dinner here yet. Atmosphere is a great looking industrial space. They warmed it up with a huge wall of liquor and canned goods. 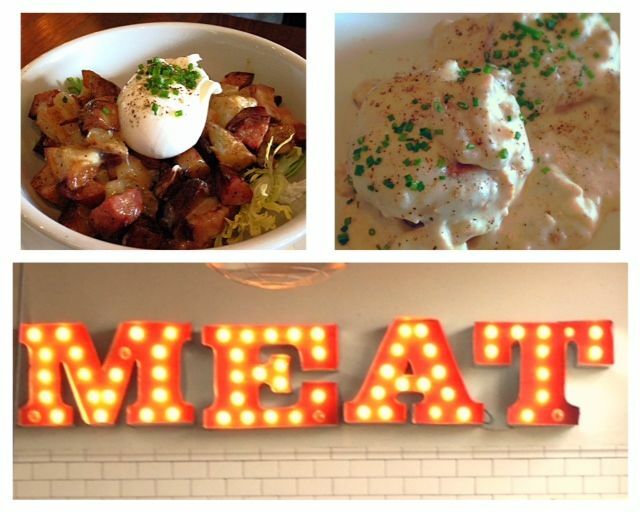 Prices are $13 for the Eggs Benedict, $9 for Biscuits & Gravy and $12 for Hash. Services was stellar. Everything was kept full, questions were answered and they were on top of everything. Drinks were Steven Smith tea and stumptown coffee. I also noticed quite a beer list, so I do need to go back for dinner. Olympic Provisions is located on SE 2nd & Washington. There is also a NW location.